RGCD.DEV is the game development division of RGCD, currently working on Windows and Android platforms. We're a two-man team based in Exeter, UK, both of us long-standing videogame aficionados with a passion for creating classic arcade games that WE want to play. If other people like them too - well, that's just a bonus. Scroll down the page for more information on our current portfolio of projects (in addition to a little bit of blurb about us and what we do). More avoid-em-up than traditional shmup, r0x (Extended Play) is a simple arcade game where ammo is scarce and you are rewarded generously for taking risks and flying dangerously. Graze rocks, bullets and enemies to recharge your cannon and thrust at breakneck speed through the deadly meteor storm to rack up an epic score! 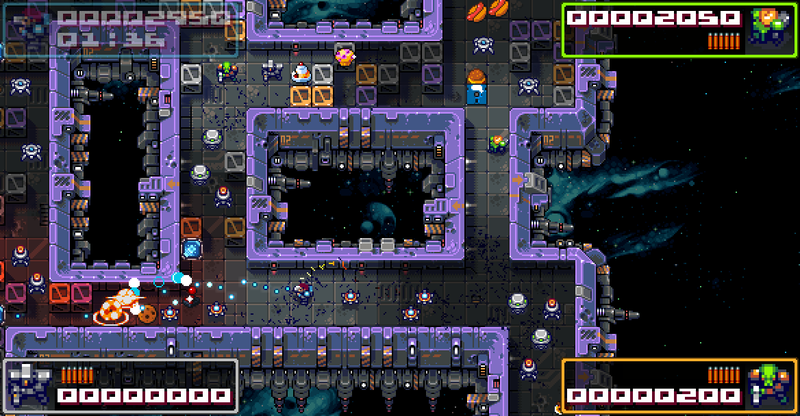 r0x (Extended Play) is available on itch.io, gamejolt, Amazon, Steam or indieDB. View related news posts here. 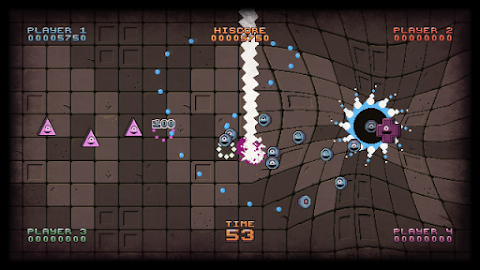 Genre-mashing, dimension-hopping, arena-based quasi-shmup for up to four players. Grab your Conganoid and join the elder gods in the competitive ceremonial slaughter of geometric, pan-dimensional critters. T-3 minutes until annihilation! Infiltrate deep space outposts, eliminate the shield generators, destroy the sentient robot scourge and bug-out before the sabotaged reactor blows. 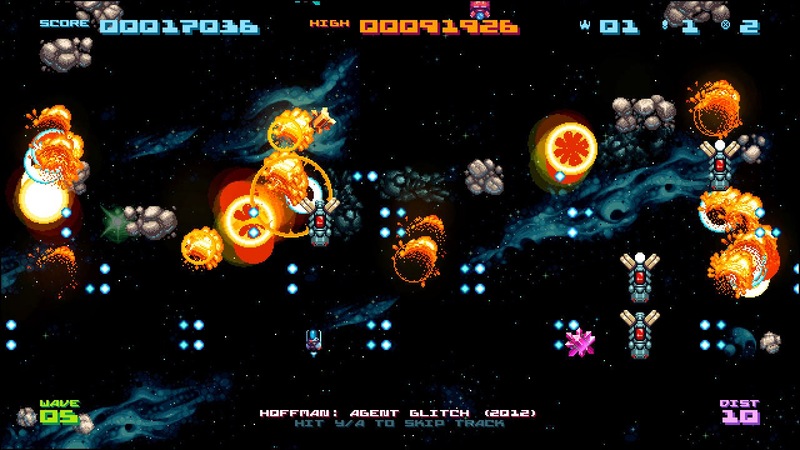 A tactical arcade shmup that follows on from where Robotz DX (2010) left off, Blastard Squad will feature larger scrolling levels, multiple worlds, unique co-operative/competitive multiplayer support, epic explosive action and a ludicrous quantity of loot to salvage. Although our projects have involved a wide cast of collaborators from the gamedev and demoscene, RGCD.DEV as a corporate entity essentially consists of just two people. Original founder of RGCD (from back when it actually meant Retro Gamer Compact Disc, instead of Radioactive Generation Computer Distractions or whatever the hell we are now), James acts as lead designer and sloppily attempts to get his ideas on screen, only for Jamie to later optimise and improve them one-hundredth-fold. 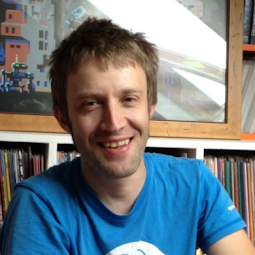 James is also the guy behind our Twitter, Facebook and Google+ accounts. 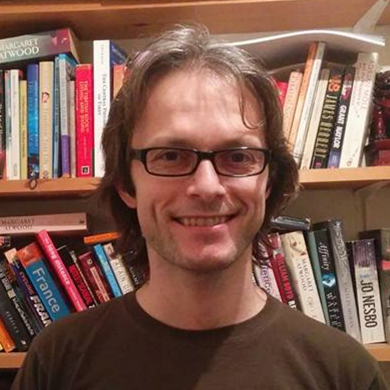 Jamie first hooked up with RGCD through the Commodore 64 scene, specifically via the release of Hyper Viper, a C64 game that he'd developed whilst teaching himself 6502 assembly over the course of a year. For fun. As well as being the lead programmer at RGCD.DEV, Jamie is also heavily involved in design, working out intelligent solutions to James' feature requests as well as adding his own ideas to the mix.